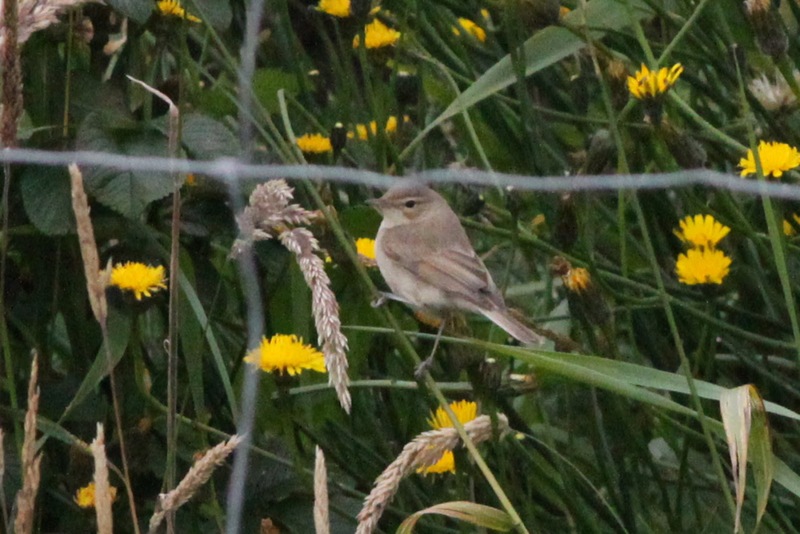 Fair Isle Bird Observatory: the Warden's diary: Hello again. Crikey, it’s been a while. Where does the time go? Apologies for the lack of updates recently; especially as it’s been a good spell for birding since my last post. So, what have we been up to? Well, there’s been a lot of Meadow Pipit counting, some good migrants, the visit of two sailing ships with accompanying events and socialising (the ships were somewhat confusingly called ‘The Wylde Swan’ and ‘The Swan’, which are totally unrelated, but have coincidentally arrived within three days of each other) and the normal day to day life of FIBO (which at the moment also includes a seemingly permanently teething Freyja; she’s been teething for so long now I’m sure she must be a shark). 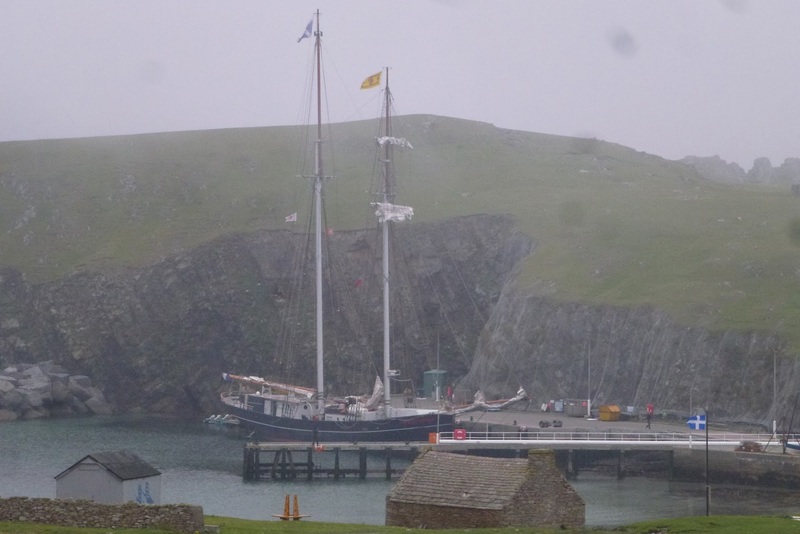 The Swan has brought a crew of scientists and artists who are exploring the issues surrounding marine conservation, an especially relevant feature for Fair Isle, where the community continues to campaign for a Marine Protected Area. 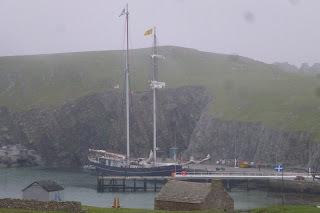 The Wylde Swan in North Haven - the world's largest two mast topsail schooner no less. Probably best if you settle down and make yourself a nice cuppa if you want to catch up on the last ten or so days (or just look at the pictures and scan through for the red and orange species!). ... and at the weekend. I could still hear them, but conditions weren't really suitable for monitoring! ﻿﻿The highlight of the period was the Booted Warbler that arrived at the Chalet on 22nd before moving to the Obs, then the School, Da Water and then reappearing at Stackhoull on 28th after disappearing for a day. Rarities on the march. Booted Warbler at Chalet. 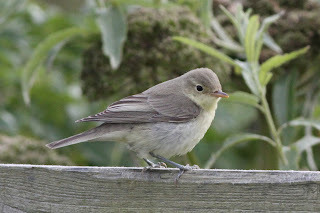 Images taken at the Obs and School later in the week seemed to suggest that the samebird was involved in all sightings. A large arrival of Greenish Warblers to the UK saw one day when birds were seen on the nearest land to the north (Sumburgh), south (North Ronaldsay), east (Utsira) and west (Foula) of us, but they seemed incapable of finding their way through the fog to us until 26th when two appeared sat next to each other in the garden at Kenaby, where they remained until 27th. 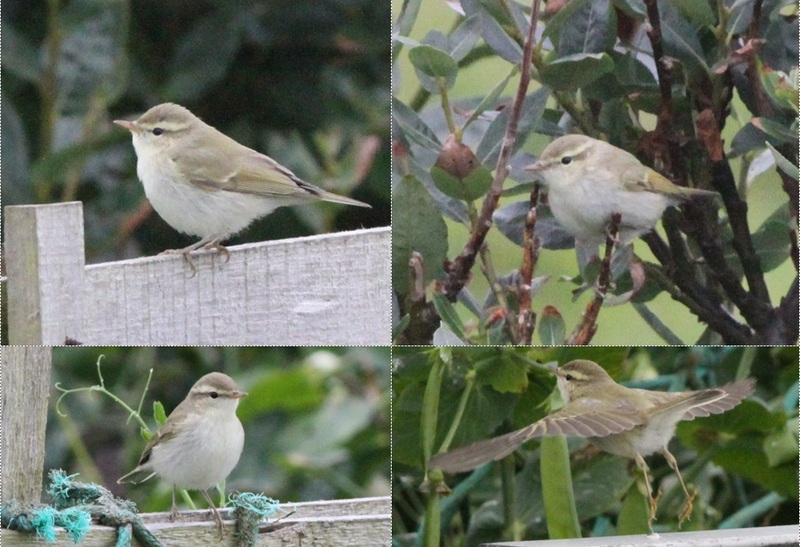 Greenish Warblers are almost exactly twice as rare as Arctic Warblers on Fair Isle and these were the first since a spring bird in 2011. Presumably the more northerly breeding range of Arctic Warbler explains why it occurs more regularly here than Greenish, but why the ratio of these two similar species is so different to Shetland (where Arctic only marginally outnumbers Greenish) isn’t immediately obvious. Greenish Warblers at Kenaby. 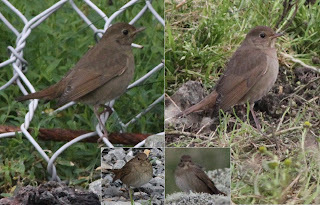 The top two images show the two different birds, which sadly never sat quite close enough together to get a picture that showed them both in the same image. Another new arrival on 26th was a Thrush Nightingale found by Deryk as it sheltered around the Good Shepherd, which was receiving maintenance in its noost at North Haven. What appeared to be the same bird was at Haa on 28th, although it quickly vanished, so it may yet appear elsewhere on the island in coming days. 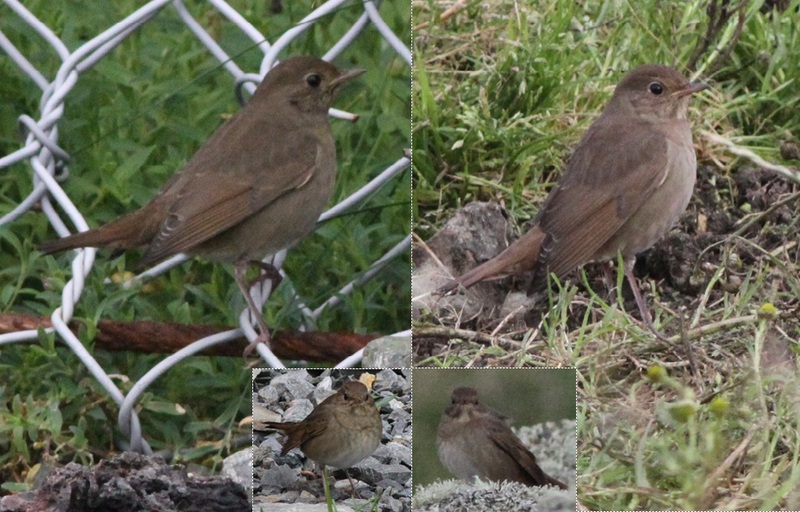 Thrush Nightingale, the two images on the left are taken at the Harbour, the two on the right from the Haa. 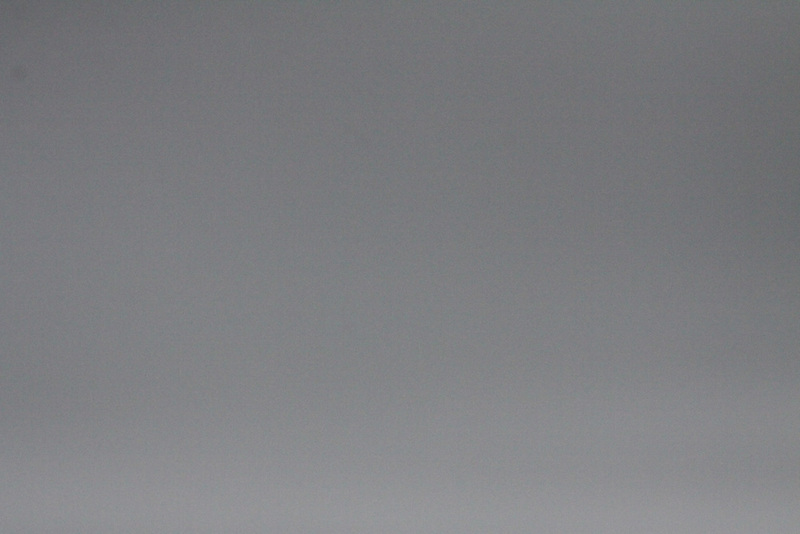 Similarities in the wing, for example, would appear to confirm that the same bird is involved in sightings. The main difference seems to be an addition of a blob of white (paint?) on the tail by the time the bird reached the Haa, presumably picked up whilst hanging around in the Good Shepherd winch house and surrounding area. Arrivals of scarcities included our second and third Barred Warbler of the autumn (22nd and 23rd), Common Rosefinch (one until 21st then another from 25th-27th), a Wryneck in the Vaadal (23rd, although there was to be no repeat of the large fall of this species that occurred on the 24th August 2011), Icterine Warbler at Utra then Stackhoull (25th-28th), Marsh Warbler at Schoolton on 22nd and Corncrake sightings on 23rd and 28th, with two on the latter date. The Icterine Warbler at Stackhoull proved to be a showy individual after first being found at Utra (by the Finance Director's daughter Katie). To add to some impressive day lists, the Citrine Wagtail remained until 22nd and the Subalpine Warbler was still present until at least 28th, although for the first time in several weeks it was seen away from Schoolton, going on a wander to Shirva and Stackhoull, before returning ‘home’ on 28th. A number of species put in their first autumn appearances including on 20th: Garden Warbler (increasing to 7 on 26th), 21st: Grasshopper Warbler, 22nd: Pied Flycatcher (rising to a peak of 10 on 23rd), 23rd: Lesser Whitethroat, Whitethroat (which peaked at 3), Tree Pipits (with up to 4 then recorded), 25th: Kestrel, Redstart (up to 4 were seen), Whinchat (rising to 7), 26th: Blackcap, 27th: Sparrowhawk, Merlin, (the only other raptor of the period was Peregrine, with a female seen arriving off the sea from the North on 28th), Spotted Flycatcher, Robin (which rose to 3 on 28th) and 28th: Blackbird. 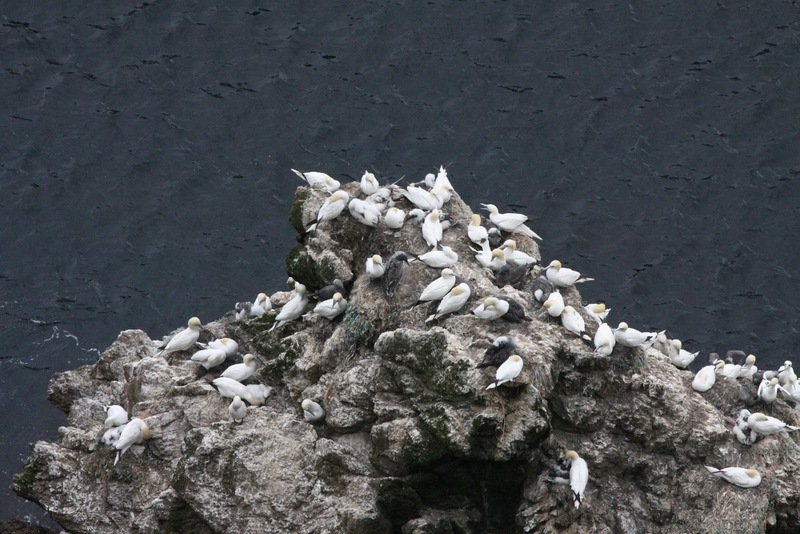 Migrants on the cliffs are always one of the exciting features of a Fair Isle autumn. Here a Pied Flycatcher tries to blend in to the cliffs of Gunnawark. ﻿Although none of these species appeared in particularly large numbers, there were major arrivals of pipits and wagtails recorded throughout, making the island feel very full of birds, which is always a pleasant experience to bird through. There were over 600 Meadow Pipits on 20th-21st, with numbers then rising to 710 on 23rd August. Throughout this time, there were several flocks seen heading south, so no doubt thousands of these birds have passed through the island during the last ten days. The 21st also saw the period’s highest count of Rock Pipits (an impressive 175), alba Wagtails (126) and Wheatears (177), whilst Twite were also arriving and peaked at 240 on 27th. Other migrants recorded during this period included a peak of 32 Willow Warbler (25th), up to 3 Reed Warbler, 2 Crossbill (21st), Sedge Warbler (22nd and 24th), up to 4 Grey Heron, 2 Swallow (26th) 2 House Martin (27th) and Swift (27th). August is a good month for the variety of different types of birds on the move, with other high counts including: 137 Lesser Black-backed Gull (20th), 138 Common Gull (25th), 24 Black-headed Gull (28th), 57 Teal (25th) and 16 Wigeon (27th). Finally, the sea produced a few birds of note, including ‘blue’ Fulmar, 3 Storm Petrel and 2 Sooty Shearwater (all 27th, with another Sooty on 20th). 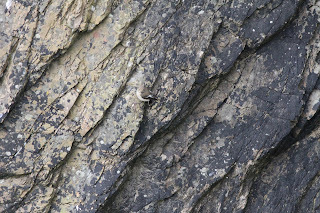 Other wildlife was also of interest during this period, with a Basking Shark seen off Buness being the pick of the bunch. A sighting in 2004 was the first since the 1970s and was followed by records in 2006, 2009 and 2010, but this is the first since then. 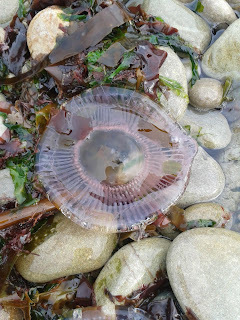 The same day also saw a Minke Whale and a Porpoise and a large wreck of Jellyfish in the Havens. We’ve also enjoyed a small influx of Painted Ladies, Red Admirals and a couple of Peacock and Small Tortoiseshell to round off recent sightings. Part of the large wreck of Jellyfish that washed up in the Havens on 28th, most individuals were rather small, although some approached saucer-size. So, thanks for staying with me, I suspect there may not be too much to keep you updated on for the next few days as westerly winds really kick in (they should be gale force by the weekend) and migration is likely to grind to a halt. It looks pretty constantly in the west for a while, which may not be great, but as we’re almost in September and the excitement levels are being ramped up then perhaps an American wader is on the cards, how about Fair Isle’s first Wilson’s Phalarope?